I had a bit of a kitchen snafu recently and I’m not embarrassed to admit it. For the summer I’m living in a house with lots of other people, which means a small shared kitchen and often a lot of commotion that’s usually quite fun. The other day I was making popcorn in a pot on the stove (yes, I know this seems odd, trust me I’ve been told before but I don’t have a microwave during the school year, remember?) and one of my housemates and I were chatting. Distracted, I didn’t notice until suddenly everything smelled like smoke and it was clear that the popcorn was burning and not too far from becoming a small oil fire. Just for the record, if this happens to you, usually the best thing to do is turn off the stove, throw the pot outside and wait for it to cool down before you throw away the charred popcorn remains. What’s my lesson from this? Sometimes life happens, even if you cook a lot that doesn’t prevent you from making (sometimes big) mistakes. Does it mean I will never make popcorn again? Maybe No. I am a firm believer in being daring with cooking, while accepting that sometimes mistakes happen. Ultimately, you have to be willing to put yourself out there again and take a risk or two. 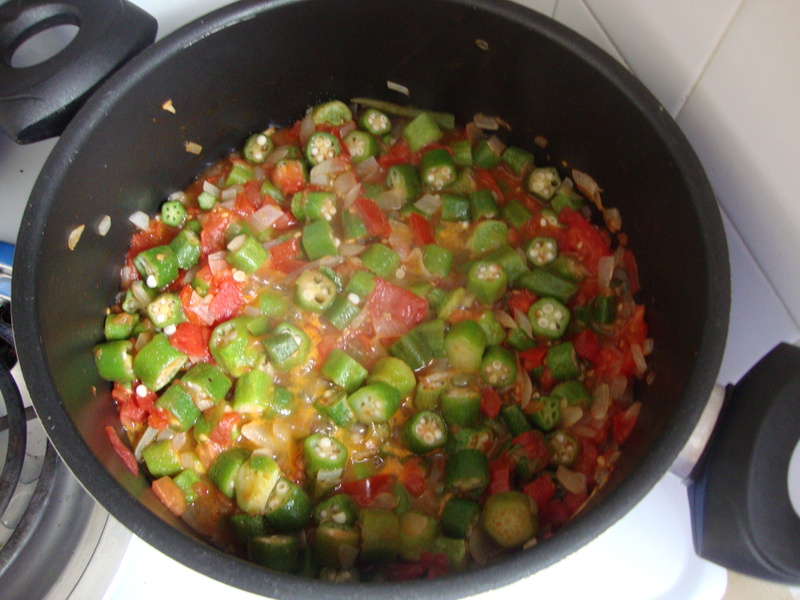 For those with more trepidation who are less inclined to risk starting small fires in their kitchens, I offer this quick and easy okra dish as a baby step. I really enjoy cooking with okra and this recipe is effectively a variation of something my mother makes except she makes it with shrimp (and I’m too cheap for that at the moment, though I don’t think it’s lacking without). This is one of my favorite easy dishes to make when I’m missing home. Bonus points if it is the summer and you can find good fresh corn, probably the kernels from 2 or 3 ears will be enough. Bring a large pot to medium low heat, add olive oil. Mince your onion finely and add. Let cook slowly, for about 20 minutes, until onions are soft and translucent (but not brown). 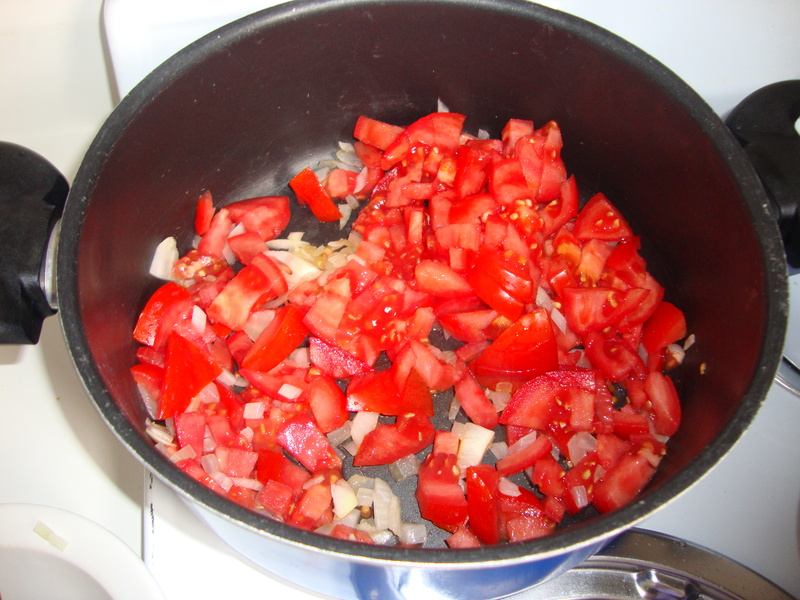 Wash and chop your tomatoes and thrown them in. Let cook for another 20- 30 minutes until they are soft and don’t taste raw. Put the frozen okra in a strainer and rinse so that all the ice comes off. Throw into the pot and cook for at least 20 minutes until they’re no longer slimy. 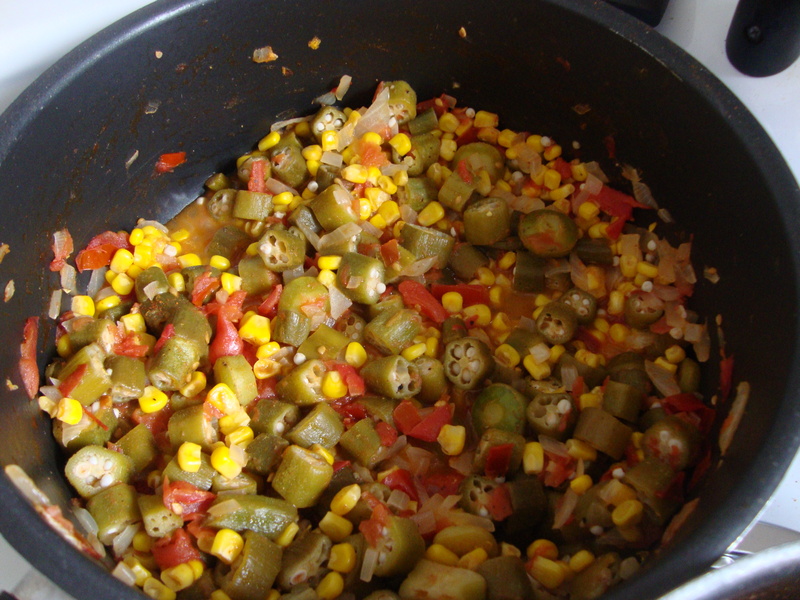 After the okra are ready, drain your can of corn. Add to the okra and heat through. Season to taste. Serve with rice or grits!